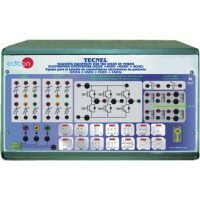 Unit with Computer Control and Data Acquisition System designed to study the basis of Power Electronics. 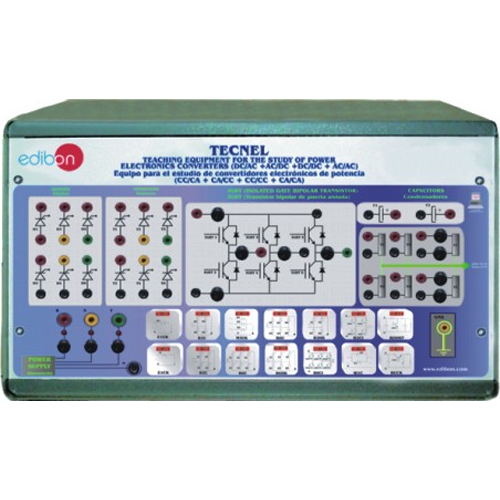 It allows students to study AC/DC, DC/AC, DC/DC, AC/AC converters. Power supply connections for Vr, Vs, Vt, Neutral and Ground. Data Acquisition Board Connector (SCSI connector). Main fuses (Vr, Vs, Vt) and LEDs. PCI Data acquisition board (National Instruments) to be placed in a computer slot. Number of channels= 16 single-ended or 8 differential. Resolution=16 bits, 1 in 65536. Sampling rate up to: 250 KSPS (Kilo samples per second). Number of channels=24 inputs/outputs. D0 or DI Sample Clock frequency: 0 to 1 MHz. Compatible with all actual Windows operating systems. Graphic and intuitive simulation of the process in screen. Compatible with the industry standards. Registration and visualization of all process variables in an automatic and simultaneously way. Flexible open and multicontrol software, developed with actual windows graphic systems, acting simultaneously on all process parameters. Management, processing, comparison and storage of data. Sampling rate up to 250,000 data per second. Comparative analysis of the obtained data, after to the process and modification of the conditions during the process.